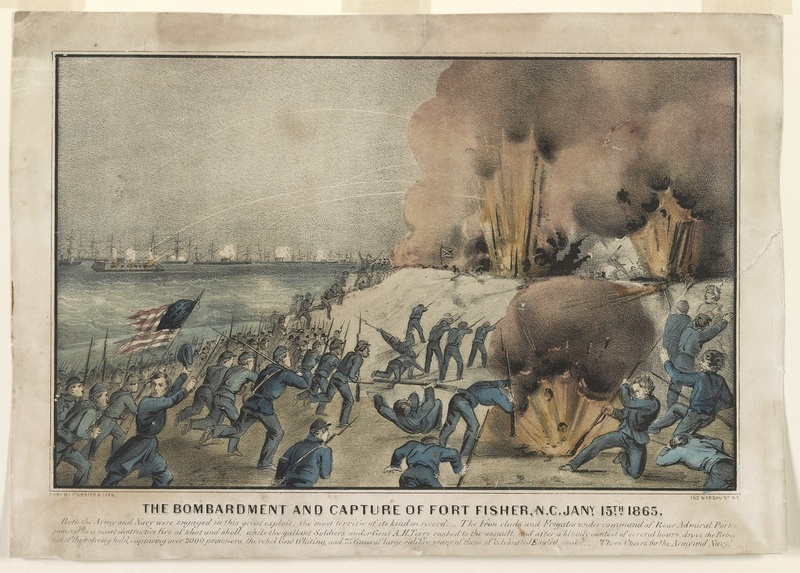 A Currier & Ives print depicts the capture of Fort Fisher. The caption read: “Both the Army and Navy were engaged in this great exploit, the most terrific of its kind on record. The Iron clads and Frigates under command of Rear Admiral Porter poured in a most destructive fire of shot and shell; while the gallant Soldiers under Genl. A.H. Terry rushed to the assault, and after a bloody contest of several hours, drove the Rebels out of their strong hold, capturing over 2000 prisoners, the rebel Genl. Whiting, and 75 Guns of large calibre; many of them of ‘celebrated English make’. Three cheers for the Army and Navy!” Click to enlarge (Library of Congress). 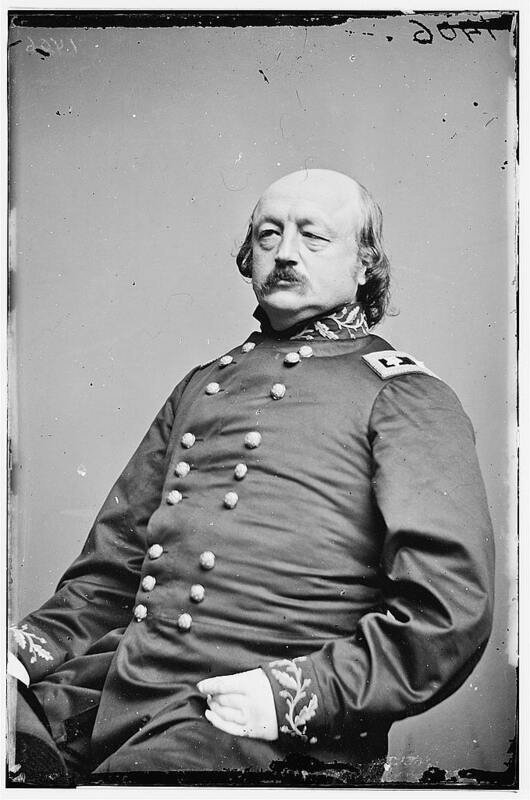 The reason Meade believes the fall of Fort Fisher will be bad news for Benjamin Butler is because Butler lost his command of the Army of the James because of his failure to take the fort back in December. The fort, at the mouth of the Cape Fear River, controlled access to Wilmington, North Carolina, the last open port for the Confederacy. Maj. Gen. Godfrey Weitzel’s XXV Corps (African-American troops led by white officers) had made the unsuccessful land attack. When the attack stalled, Butler had pulled out rather than follow Grant’s orders to place the fort under siege. A second attack, led by Brig. Gen. Alfred Terry (with support, once again, by a naval force under Adm. David Porter) captured the fort on January 15. The interior of Fort Fisher (Library of Congress). To-day we have the news that the second expedition has succeeded in taking Fort Fisher, which is a most important and brilliant success. It will, however, have a most damaging effect on Butler’s case, and will also materially injure Weitzel’s reputation. I must confess I thought Butler’s report cleared him in every particular except two. First, he should not have wasted three days, waiting for the enemy, when he knew the fort was weakly garrisoned. Secondly, he should not have left there because an assault was impracticable; and his statement that a siege was not within his instructions, is contradicted by Grant’s written instructions, which say that, if a landing is effected, and the work not carried, he is to entrench and hold on. There will, no doubt, be bitter controversy on these points. Grant has been away for three days, to parts unknown, though I suppose Wilmington. Meade’s correspondence taken from The Life and Letters of George Gordon Meade, Major-General United States Army, Vol. 2, (New York: Charles Scribner’s Sons, 1913), p. 256. Available via Google Books. 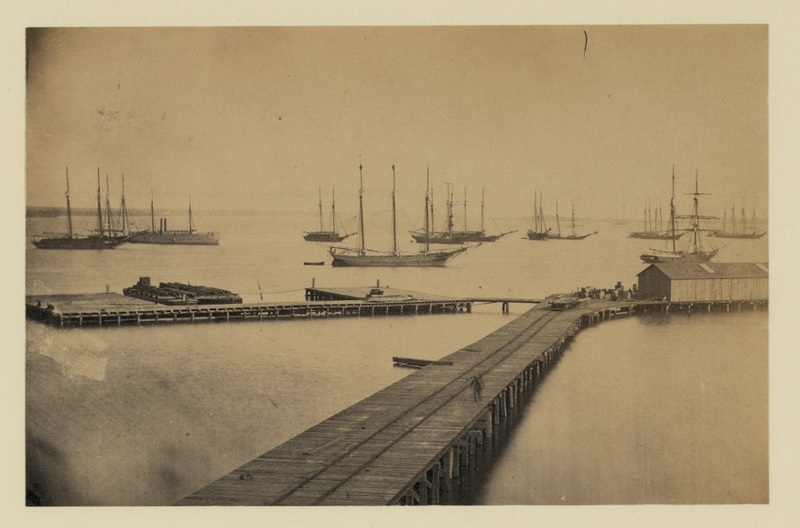 One of the wharves at City Point, in a photograph taken sometime in January 1865 (Library of Congress). General Meade has returned to camp. He left the army for Philadelphia on December 30 and stayed there until he received a message recalling him on January. The visit home was tinged with sadness because of the failing health of his oldest son, John Sergeant. The return trip was not uneventful, as Meade describes in his letter of January 10. He also mentions the dismissal of Benjamin Butler. 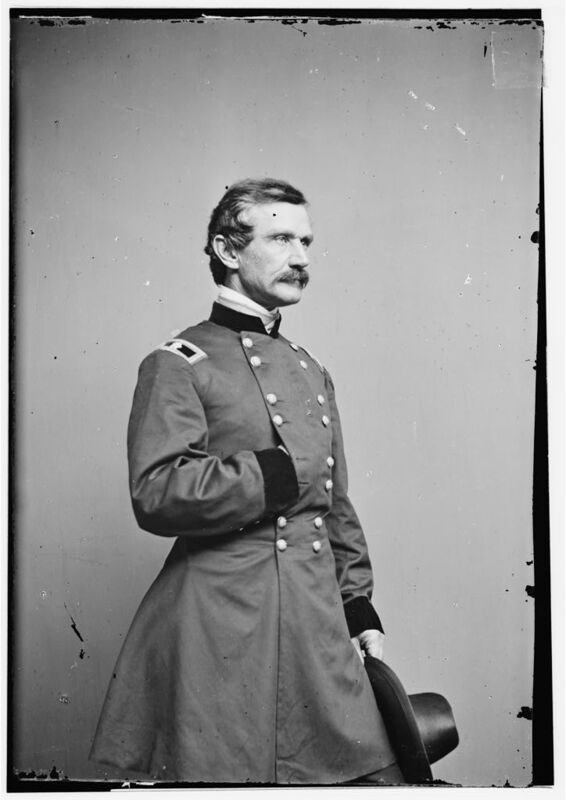 Grant had long longed to rid himself of the cockeyed political general, and Butler finally gave him the opportunity the general-in-chief sought by bungling an attack on Fort Fisher in North Carolina. Grant sent him packing. I reached City Point at 6 p.m. to-day. I found the cause of my recall to be as I expected. General Grant had received information of Lee’s sending off two divisions of troops, and was, and is, under the impression that it is the commencement of the evacuation of Richmond. Should this prove to be the case, or should Lee materially weaken his force, we will take the initiative, and for this contingency I was required. I explained to General Grant Sergeant’s condition and my earnest desire to remain with him. He expressed regret he had not known all I told him, and promised to let me return to Philadelphia as soon as this affair was settled. As I do not believe Lee is going to give us any chance, I am in hopes it will not be long before I return. I telegraphed you this morning from Fortress Monroe, because we had last night an accident on the bay, which I feared might be exaggerated in the papers, and you alarmed. The night was dark and foggy, and we were run into by a schooner. Fortunately the damage was confined to the upper works, and although four lives were lost, and several bruised, we received no material injury, and our boat continued on. For a time, however, before the extent of the injury was known, there was much alarm and excitement on board our boat, which was unusually crowded, owing to the ice on the Potomac. The great subject of discussion in the army is the recent relieving of General Butler. He was relieved by the President, on Grant’s request. The particular cause had not been made public. It is hardly necessary I should tell you how much I have suffered since I left you. All I can do is earnestly to pray God to have mercy on dear Sergeant and yourself, and to give you strength to bear up under the affliction you are visited with. My heart is too full to write more. Meade’s correspondence taken from The Life and Letters of George Gordon Meade, Major-General United States Army, Vol. 2, (New York: Charles Scribner’s Sons, 1913), p. 255. Available via Google Books. George Meade writes a somewhat gossipy letter to his wife on December 18. Among its items are Meade’s impressons of General George Thomas, who had just thrashed John Bell Hood at the battles of Franklin and Nashville. He also reports on new activity by th Joint Committee on the Conduct of the War, which has started to investigate the debacle of the Crater, and the latest news of Benjamin Butler, who has departed on his ill-fated attack on Fort Fisher. I am glad you saw Major Smith and liked him. I found him very intelligent and amiable. I gave him a letter to Oliver Hopkinson, as he wanted to see some duck-shooting; but I believe he found some one in Baltimore who put him in the way of having some sport. I knew that Captain Chesney was the instructor of engineering at the Military College of Woolwich, but was not aware that his service had been confined to this duty. We have all been greatly delighted at the good news from Tennessee. Thomas is very much liked by all who know him, and things at one time looked unfavorable for him, it appearing as if he was giving Hood too much time; but it now turns out Old Thom, as we call him, knew what he was about, and has turned the tables completely. Don’t you remember, when we were at West Point, meeting his wife, who was at the hotel? He was then in Texas, and she was expecting him home. She was a tall good-natured woman, and was quite civil to us. I don’t believe the bill to cut off the heads of generals will either pass the Senate or be approved by the President. By-the-by, I see the Senate, on motion of Mr. Anthony, of Rhode Island, has directed the Committee on the Conduct of the War to enquire into the Mine fiasco on the 30th of July, and that Burnside has already been summoned to testify. This is a most ill advised step on the part of Burnside and his friends, and can only result in making public the incompetency of that officer. I would, of course, rather not have to appear again before this committee, because they are prejudiced and biased against me, and their examinations are not conducted with fairness. Still, I shall not shrink from the contest. Grant is still in Washington, though expected back to-morrow. The change of affairs in Tennessee will render his presence there unnecessary. An expedition sailed the other day from Fortress Monroe, composed of the fleet and a detachment of troops. Grant took these from Butler’s army, intending Weitzel should command them; but much to every one’s astonishment, Butler insisted on going, and did go, with the expedition. Mrs. Lyman has sent me a Christmas present of a box of nice cigars. Meade’s correspondence taken from The Life and Letters of George Gordon Meade, Major-General United States Army, Vol. 2, (New York: Charles Scribner’s Sons, 1913), pp. 252-3. Available via Google Books. Benjamin Butler. He was a mediocre general but a wily politician (Library of Congress). In his notebook entry for November 27, Theodore Lyman described how General Benjamin Butler said “when they made him a lawyer they spoiled a good mechanic; when they made him a general they spoiled a good lawyer.” Butler did have a weakness for invention. In fact, it will soon help lead to his downfall, following the failure of his great scheme to destroy Fort Fisher by stuffing a vessel with explosives and blowing it up. I did not have room to tell you of the ingenious inventions of General Butler for the destruction of the enemy. He never is happy unless he has half a dozen contrivances on hand. One man has brought a fire-engine, wherewith he proposes to squirt on earthworks and wash them all down! An idea that Benjamin considered highly practicable. Then, with his Greek fire, he proposed to hold a redoubt with only five men and a small garden engine. “Certainly,” said General Meade; “only your engine fires thirty feet, and a minie rifle 3000 yards, and I am afraid your five men might be killed, before they had a chance to burn up their adversaries!” Also he is going to get a gun that shoots seven miles and, taking direction by compass, burn the city of Richmond with shells of Greek fire. If that don’t do, he has an auger that bores a tunnel five feet in diameter, and he is going to bore to Richmond, and suddenly pop up in somebody’s basement, while the family are at breakfast! So you see he is ingenious. It is really summer warm today; there are swarms of flies, and I saw a bumble-bee and a grasshopper. Theodore Lyman’s letter is from Meade’s Headquarters, 1863-1865: Letters of Colonel Theodore Lyman from the Wilderness to Appomattox, p. 284. Edited by George R. Agassiz. Boston, Massachusetts Historical Society, 1922. Available via Google Books. Black soldiers from the Army of the James labor on Benjamin Butler’s canal at Dutch Gap (Library of Congress). Theodore Lyman continues his account of the visit to Benjamin Butler’s headquarters. One amazing thing about this post is that Lyman describes the test of what can only be called a flamethrower. In Meade’s Army: The Private Notebooks of Lt. Col. Theodore Lyman, editor David Lowe says the “Greek fire” was probably “a combustible solution of phosphorus in bisulfide of carbon.” Lyman writes more about Butler and his inventions in tomorrow’s letter. Let me see, I had got to Fort Harrison, had I not? Really I got so sleepy last night over the second sheet that I should not be surprised if it contains numerous absurdities. From the Fort you have an excellent view of the Rebs in their line opposite, their main fort being only 800 yards distant. I was surprised they did not fire upon us, as there was a great crowd and evidently several generals among us. But I believe they never shoot. The pickets, on either side, are within close musket-range but have no appearance of hostility. There was one very innocent “Turkey,” who said to me: “Who are those men just over there?” When I told him they were Rebs, he exclaimed: “God bless me!” and popped down behind the parapet. . . . Thence we all went to view the great canal. You will notice on the map, that the river at Dutch Gap makes a wide loop and comes back to nearly the same spot, and the canal is going through there. This cuts off five or six miles of river and avoids that much of navigation exposed to fire; and it may have strategic advantages if we can get iron-clads through and silence the Rebel batteries on the other bank. The canny Butler sent an aide to see if they were shelling the canal, who reported they were not; so we dismounted a little way off and walked to the place. It was very worth seeing. Fancy a narrow ridge of land, only 135 yards wide, separating the river, which flows on either side; a high ridge, making a bluff fifty feet high where it overhangs the water. Through this a great chasm has been cut, only leaving a narrow wall on the side next the enemy, which wall is to be blown out with several thousand pounds of gunpowder. We stood on the brink and looked down, some seventy feet, at the men and the carts and the horses at work on the bottom. Where we stood, and indeed all over the ridge, was strewed thickly with pieces of shell, while here and there lay a whole one, which had failed to explode. Had the Rebs known that a Lieutenant-General and two Major-Generals were there, they would hardly have left us so quiet. . . . Though we got off very nicely (I thought as I stood there: “Now that line is the shortest one to our horses, and you must walk it with dignity—not too fast when they begin to shell”), there was a fat “Turkey” who came after us and was treated to a huge projectile, which burst over his head; he ran and picked up a piece and cried out: “Oh! it’s warm. Oh!! it smells of sulphur. Oh!!! let us go now.” He was delighted with this and all other adventures, and was quite elated when his horse tumbled in a ditch and muddied him greatly. After dark we were treated to an exhibition of a “Greek fire.” They burst a shell in a bunch of bush and immediately the whole was in a roaring blaze. “They’ve got the fuses to work well now,” said Grant calmly. “They tried the shells on three houses, the other side of the river, and burnt them all without difficulty.” Good thing for the owners! Then they spirted the stuff through a little hose and set the stream on fire. It was a beautiful sight and like the hell of the poets, with an unquenchable fire and columns of black smoke rolling up. Owing to these pyrotechnics, we only got home at midnight. In my next I will tell more of the genius of Butler. General Meade, you will be glad to learn, has been informed officially, that he will be appointed a Major-General in the Regular Army, to rank General Sheridan! Theodore Lyman’s letter is from Meade’s Headquarters, 1863-1865: Letters of Colonel Theodore Lyman from the Wilderness to Appomattox, pp. 282-3. Edited by George R. Agassiz. Boston, Massachusetts Historical Society, 1922. Available via Google Books. Artist William Waud sketched the activity at “Ben Butler’s canal at Dutch Gap.” Click to enlarge (Library of Congress). Both George Meade and Theodore Lyman write home about a visit to Maj. Gen. Benjamin Butler, commander of the Army of the James. Lyman, of course, provides the most detail. 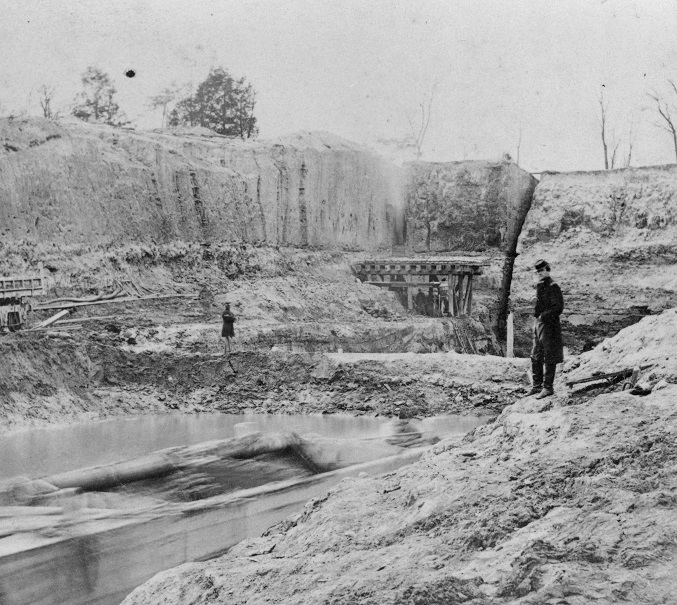 The Dutch Gap Canal was Butler’s ambitious scheme to foil the Confederate defense at Drewry’s Bluff on the James River by digging a canal across a neck of land and bypass them altogether. It was perfectly feasible on paper but a very difficult feat to accomplish. The canal was eventually completed, but not until after the war ended. Grant, who had attempted something similar against Vicksburg, seemed happy to let Butler occupy himself with canal digging. Yesterday I accompanied General Grant on a visit to General Butler’s lines and the famous Dutch Gap Canal, which I had never seen. We had a very pleasant day, remaining with Butler till after dark to witness some experiments with the Greek fire, and getting home about 11 p.m. I send you an extract from the Washington Chronicle, received to-day. It confirms what General Grant told me, and is designed to make people believe that I was already appointed when Sheridan was made. As Forney is closely allied with the powers that be, I take it for granted the above supposition is correct, and that he speaks by authority and for a purpose. I have no objection to this being arranged, so long as the essential point, justice to me, is conceded. I had a visit this evening from Dr. McEuen who is here to take away his son Charles, who is major of the One Hundred and Ninety-eighth Pennsylvania, and who is now quite sick with fever. The doctor seems in good spirits and not much changed, except being considerable greyer than I used to see him years ago. Lyman’s almost Dickensian account of the visit will continue tomorrow. I think I will occupy the remainder of this letter with an account of our picnic yesterday to Butlerdom. The day was further remarkable for the departure of my dear General Humphreys to take command of the 2d Army Corps. For Hancock has got a leave of absence, and will doubtless be put to recruiting fresh troops, while it is hoped that the President will permanently assign Humphreys to this Corps. He is in high glee at going, and will be in despair if a big fight is not got up for his special benefit. He was a great favorite and was escorted by some fifteen mounted officers of the Staff to his new quarters, at which compliment I think he was gratified. I regretted not to be with him, but had to go with the General, who started by the mail train, at 8 a.m., to be early at Grant’s Headquarters, whence they were to start. We took our horses on a freight car. In the train we found Generals [Gouverneur] Warren and [Samuel] Crawford, who were invited to be of the party. Arrived at City Point, we discovered that the Lieutenant-General was still in bed, whereat Meade did laugh, but the three stars soon appeared and went to breakfast. After which meal, our horses were put on the boat and we put ourselves on, and off we started. The party was a big one. There were Generals Grant, Meade, Warren, Crawford and [Rufus] Ingalls, and several Staff officers. There were then the bourgeois: to wit, a great many “Turkeys” (gentlemen who had come down to distribute those Thanksgiving fowls); two men who wanted to sell a steamer; one Senator, viz., [James] Nesmith of Oregon, and one political blackguard named H____, whose special business was to praise a certain Greek fire, of which more anon. This fellow’s name is usually prefixed by “Pet.” He has wild hair and beard and a face showing a certain ability; his distinguishing mark, I am told, is the absence of any sort of morality or principle. With him was his son, a small and old boy, of whom they said that, if papa could not get the best at a game of poker, son would come in and assist. Senator Nesmith is a child of the people, and was prepared for his congressional duties by a residence of twenty-five years among the Indians. When he first got to Washington, he had never before seen a railroad, a telegraph, or a gas-light. “Senator Fessenden asked me what I thought of things. ‘Well,’ says I, ‘when I first came along I was full of the dignity of the position to which I had been elected; but now all I want to know is, who in thunder ever sent you fellers here!’“ He has plenty of brains, this same, but is a very coarse man. The “Turkeys” were of various sorts: several of them were Club men, e.g., Mr. Benson, a gentleman who seemed a middle-aged beau, with much politeness and no particular brains. He kept bowing and smiling and backing into persons, and offering his chair to everyone, from orderlies up to General Grant. He requested to know whether in my opinion he could be properly considered as having been “under fire; because,” said he, “I stood on the Avery house and could see the shells explode in the air, you know!” All this motley crowd started at once for Deep Bottom; nor should I omit to say that we had also on board a Secesh bishop—Leigh of Georgia—who was going by flag of truce to Richmond. He had remained in Atlanta, and Sherman had told him if he wished to get back, he must go via Richmond. From him they got a good deal of entertaining conversation. His opinion of Sherman was very high and complimentary. “The old Book tells us,” he said, “that the race may not be to the swift, nor the battle to the strong, and we feel that Providence will not desert our righteous cause.” “Yes,” said General Meade, “but then we feel that Providence will not desert our cause; now how are you going to settle that question?” Whereat they both laughed. The bishop was a scholastic, quiet-looking man, and no great fire-eater, I fancy. The boat made fast at Aiken’s landing, halfway between Deep Bottom and Dutch Gap. A Staff officer was there to receive us and conduct us, two miles, to General Butler’s Headquarters. Some rode and some were in ambulances. The James Army people always take pretty good care of themselves, and here I found log houses, with board roofs, and high chimneys, for the accommodation of the gentlemen of the Staff. You might know it was Butler’s Headquarters by the fact that, instead of the common ensign, he had a captured Reb battle-flag stuck up! This chieftain asked in the general officers and we were left to the care of the Staff, who were not behindhand in their civility. . . . Presently Butler climbed on his horse and led the way to see Fort Harrison, which was captured in the movements at the end of September. It was well worth seeing, for on our side of the river we have no hills: it is pretty much one plain with gullies. But here was a regular hill, of some size, dominating the whole country about. How they took the place, I hardly see, for the land is often for a mile in front of it, and the Rebs had artillery in position and a regular infantry running quite to the river. . . .
Meade’s correspondence taken from The Life and Letters of George Gordon Meade, Major-General United States Army, Vol. 2, (New York: Charles Scribner’s Sons, 1913), p. 248. Available via Google Books. Theodore Lyman’s letter is from Meade’s Headquarters, 1863-1865: Letters of Colonel Theodore Lyman from the Wilderness to Appomattox, pp. 279-82. Edited by George R. Agassiz. Boston, Massachusetts Historical Society, 1922. Available via Google Books. In his letter, Meade mentions the Dutch Gap Canal. 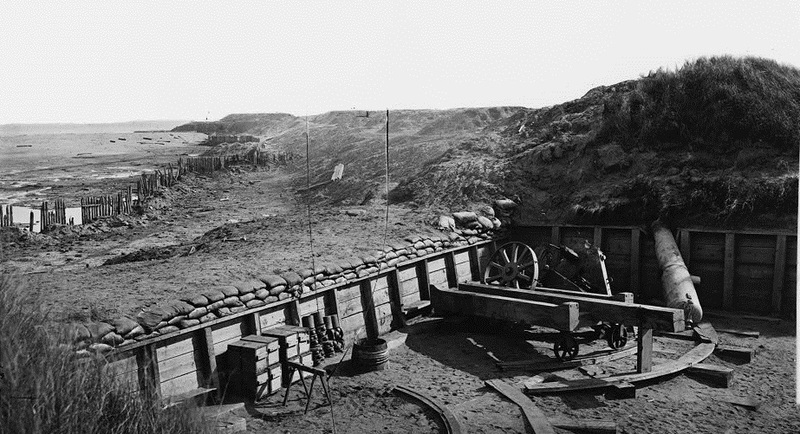 Benjamin Butler had initiated the digging of the canal on the James River to bypass Confederate forts. It wasn’t completed until after the war (Library of Congress). Meade receives word of his promotion and pronounces himself satisfied. The Mr. Cropsey is the newspaper reporter whom Meade had drummed out of camp at Cold Harbor. It seems he has now irritated Hancock, whose time with the Army of the Potomac is almost over. On my return from my visit to General Grant, I found your letter of the 23d inst. General Grant told me that, as soon as he spoke to the President, the President acknowledged the justice of his statements, and said he had hesitated when appointing Sheridan on the very ground of its seeming injustice to me, and he at once, at General Grant’s suggestion, ordered the Secretary to make out my appointment, to date from August 19th, the day of the capture of the Weldon Railroad, thus making me rank Sheridan and placing me fourth in rank in the regular army. Grant virtually acknowledged that my theory of Sheridan’s appointment was the correct one, and that without doubt, had the matter been suggested at the time, I would have been appointed a few days in advance. As justice is thus finally done me, I am satisfied—indeed, I question, if left to me, whether I should have desired my appointment announced in the way Sheridan’s has been. At one tiling I am particularly gratified, and that is at this evidence of Grant’s truthfulness and sincerity. I am willing to admit, as he does himself, that his omissions have resulted unfavorably to me, but I am satisfied he is really and truly friendly to me. I like Grant, and always have done so, notwithstanding I saw certain elements in his character which were operating disadvantageously to me. 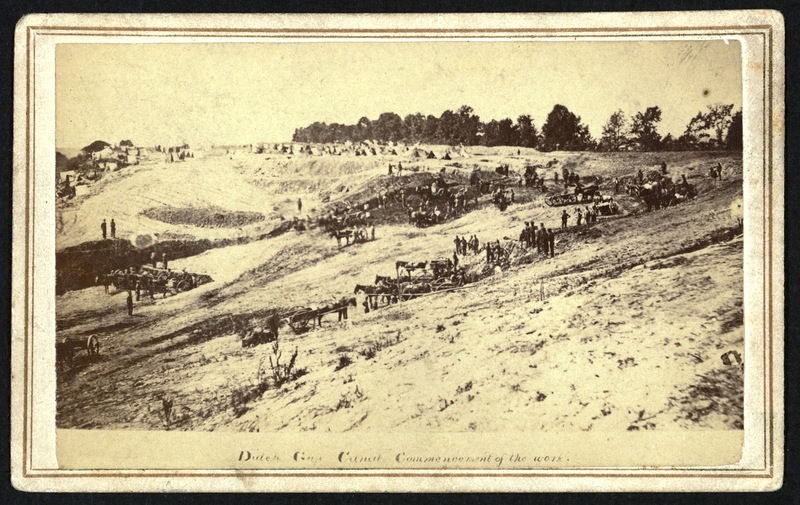 To-morrow I am going with General Grant to visit General Butler’s famous canal at Dutch Gap. Grant does not think Mr. Stanton will be removed, or that he desires the Chief-Justiceship. He says Stanton is as staunch a friend of mine as ever, and that the President spoke most handsomely of me. You will perhaps not be surprised to learn that Mr. Cropsey has again gotten himself into trouble. I received to-day a letter from General Hancock, complaining of Mr. Cropsey’s account of our recent movement. I told General Hancock to put his complaints in the form of charges and I would have Mr. Cropsey tried by a commission, and abide by its decision. Hancock leaves us to-morrow, he having a leave of absence, after which he will be assigned to recruiting duty. Humphreys takes his place. The change in my position has rendered it unnecessary to have an officer of Humphreys’s rank, as chief-of-staff. I deemed it due to him to suggest his name as Hancock’s successor. Butler has finally succeeded in getting the colored troops with this army, replacing them with an equal number of white troops. He is going to organize a corps of colored troops, and expects to do very great things with them. Meade’s correspondence taken from The Life and Letters of George Gordon Meade, Major-General United States Army, Vol. 2, (New York: Charles Scribner’s Sons, 1913), pp. 247-8. Available via Google Books. 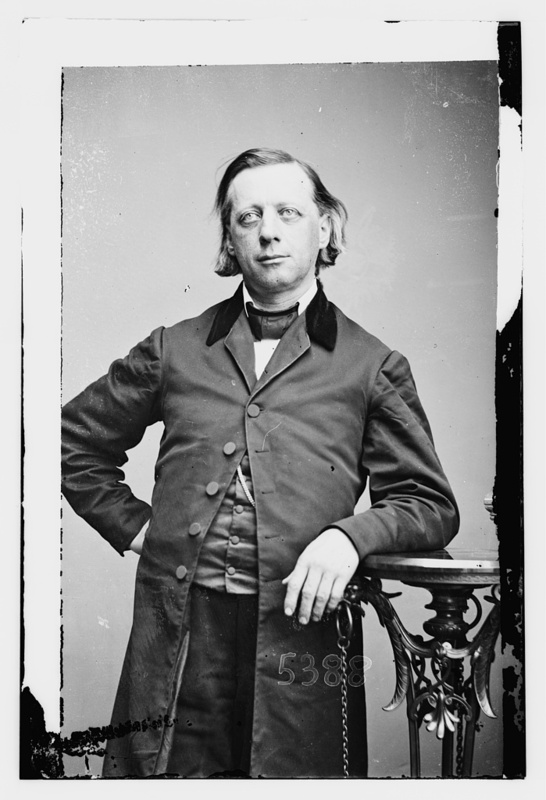 Henry Ward Beecher (Library of Congress). Is it any wonder that George Meade hated the press? Once again he’s attacked by a newspaper, and once again feigns indifference. The preacher Henry Ward Beecher, who served as editor of the Independent, was a prominent antislavery crusader. His sister was Harriet Beecher Stowe, whose Uncle Tom’s Cabin had done much to stir up antislavery passions before the war. I have seen to-day for the first time a most virulent attack on me in Henry Ward Beecher’s paper, the Independent. The piece has been in camp, I find, for several days, and many officers have been talking about it, but purposely refrained from letting me see it. I heard of it accidentally this afternoon at Grant’s headquarters, where I was on business. I cannot imagine who is the instigator of this violent assault. The idea that I hang on Grant, like the Old Man of the Sea, and am retained in command in spite of that officer’s desire to be rid of me solely on the ground of “fancied political necessity,” is most amusing. I had not seen the article when I was with Grant, or I should have called his attention to it. After all, it is probably not worth while to notice it. The military news of the week covers a wide field. 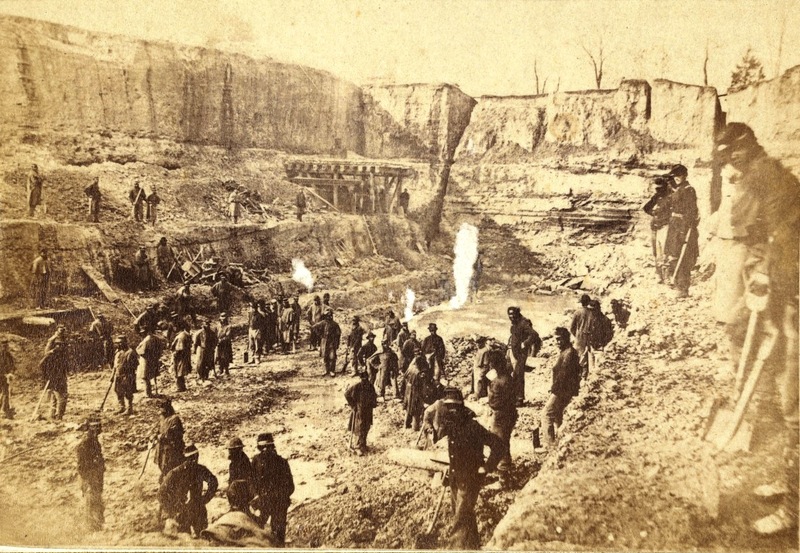 Dispatches of considerable interest have been received from the James River, from the Shenandoah Valley, from Georgia, from Kentucky, and from Missouri. The operations in all quarters are important, but the public attention, as usual, is concentrated upon Virginia, and the movements near Richmond have again attracted that regard which the brilliancy of Sheridan’s victories for the moment diverted to the Shenandoah. We are obliged to reverse the opinion of last week as to the operations of the Army of the Potomac under Gen. Meade, southwest of Petersburg. The twofold movement which Gen. Grant planned, and which ought to have been even a more complete success than we had reckoned it, now turns out to have failed from lack of generalship on the left wing. North of the James, Gen. Butler carried out his part of the programme promptly and thoroughly. South of it “somebody blundered”—Gen. Meade, to wit: and the Army of the Potomac, which he is still permitted to command, instead of carrying the Southside railroad, as was expected, gave up its great opportunity to the clumsiness of its leader. The old, old blunder was once more repeated. The Executive Officer of that army could not control its maneuvers. The Ninth Corps, proverbially tardy, was far behind when the Fifth, under Warren, had reached its appointed ground, and between the two occurred that fatal gap, into which the enemy again struck with all his force, rolled up an exposed division, captured a brigade or two, and then hurried off with his prizes. The advance was arrested, the whole movement interrupted, the safety of an army imperiled, the plans of the campaign frustrated—and all because one general, whose incompetence, indecision, half-heartedness in the war have again and again been demonstrated, is still unaccountably to hamper and hamstring the purposes of the lieutenant-general. Let us chasten our impatient hope of victory so long as Gen. Meade retains his hold on the gallant Army of the Potomac; but let us tell the truth of him. He is the general who at Gettysburg bore off the laurels which belonged to Howard and to Hancock; who at Williamsport suffered a beaten army to escape him; who, when holding the line of the Rapidan, fled before Lee without a battle to the gates of the capital; who at Mine Run drew back in dismay from a conflict which he had invited and which his army longed to convert into triumph; who, in the campaign from the Rapidan to the James under Grant, annulled the genius of his chief by his own executive incapacity; who lost the prize of Petersburg by martinet delay on the south bank of the James; who lost it again in succeeding contests by tactical incompetence; who lost it again by inconceivable follies of military administration when the mine was exploded; who insulted his corps commanders and his army by attributing to them that inability to co-operate with each other which was traceable solely to the unmilitary slovenliness of their general; who, in a word, holds his place by virtue of no personal qualification, but in deference to a presumed, fictitious, perverted, political necessity, and who hangs upon the neck of Gen. Grant like an Old Man of the Sea whom he longs to be rid of, and whom he retains solely in deference to the weak complaisance of his constitutional Commander-in-Chief. Be other voices muzzled, if they must be, ours, at least, shall speak out on this question of enforced military subservience to political, to partisan, to personal requisitions. We, at least, if no other, may declare in the name of a wronged, baffled, indignant army, that its nominal commander is unfit, or unwilling, or incapable to lead it to victory, and we ask that Grant’s hands may be strengthened by the removal of Meade. The dispatches of Gen. Butler, wholly confirmed by one from Gen. Grant, show that he has maintained the line heretofore gained on the north of the James. Lee assaulted in force on Friday last, and carried a picket defended only by cavalry, but was utterly repulsed and driven off with heavy loss in attempting to recover the position held by Butler’s infantry. The loss on our side was one-eighth that of the enemy, and the gain to us was greater than can be numerically stated; for the assault proves two things. First, that the line Butler has occupied is a severe loss to the enemy; and, second, that, although Lee is forced to assume the offensive with his attenuated army in order to regain this line, he cannot carry the coveted position. Butler is within four miles of Richmond. We privately hear the rebel works which he now holds described as more formidable than any before taken from them; and they are held in an iron grasp! The truth is, Grant presses with irresistible steadiness toward the rebel capital. Richmond is undergoing a relentless siege. Attacks from our side and sallies from theirs meet with varying fortune, but the advance, the pressure, the average of advantage is wholly with Gen. Grant, and he has never once relinquished a foot of ground gained, nor even for a moment halted in his movement for the final capture of Richmond. And to-day he is nearer than ever to his goal; to-morrow he will have taken still another step. We must add one word, to say that Gen. Sheridan has won another fight in the Shenandoah. He fell back from Harrisonburg to Strasburg, and, as the enemy’s cavalry under Rosser followed, Sheridan improved the opportunity to show that he had not forgotten his experience as a cavalry leader. He attacked Rosser, and drove him pell mell up the valley for 26 miles, with loss of 11 guns and 330 prisoners. “I thought I would delay one day to settle this new cavalry general,” says Phil. Sheridan. Meade’s correspondence taken from The Life and Letters of George Gordon Meade, Major-General United States Army, Vol. 2, (New York: Charles Scribner’s Sons, 1913), p. 236. Newspaper article from pp. 341-3. . Available via Google Books. Lyman’s letters jump back and forth in time a bit. In this letter from October 2 he writes some more about his journey back to the army. The U.S. Christian Commission had been established in 1861 and continued its efforts until the end of the war. Lyman wrote down his impressions of the events from October 2 four days later, but I have included that account with today’s letter. General Meade will tell his wife about his narrow escape from the shell in his letter tomorrow.
. . . The Washington boat was much in the style of the other — rather worse and more crowded, people and freight similar. There were more Christian Commissioners, who were joined by those who had come with me. The funniest people you ever saw! Their great and overshadowing anxiety was dinner; that was the thing. Accordingly they had deputed the youngest—a divinity student, and supposed to be a terribly sharp fellow—to lie in wait at sundry times and secure tickets for the meal. “I have arranged it all with the steward; we shall sit together,” said this foxy one. Long before the hour, they all went down and stood against the door, like the queue at a French theatre. One of them came up, a little after, wiping his mouth; and asked me with surprising suddenness, if I “was on the side of the Lord.” They were mostly Methodists, and of course very pious. One of the soldiers on the lower deck, suddenly cried out: “Oh, H____!” upon which a Christian Commissioner said: “Mr. Smith, did you think to bring a bundle of the tracts on swearing?” I told him I hoped he had brought a good many, and of several kinds, as there was a wide field in the army. All of which reminds me of an anecdote. A group of these gentlemen, going on foot and with their carpet-bags towards the front, were addressed by a veteran with “Hullo! got any lemons to sell?” “No, my friend, we belong to the army of the Lord.” Veteran, with deep scorn: “Oh, ye—es; stragglers! stragglers!” I respect these Christian Commissioners, though they are somewhat silly often. Some of them had come all the way from Wisconsin. I arrived in camp somewhat after dark and was tenderly welcomed by all, from the General down. Barstow and Humphreys were highly pleased with their gifts. To-day a curious thing occurred. While I was away, looking for a place for the new camp, General Meade rode out with the Staff. There came a conical shell, which shaved a patch of hair off the tail of General Humphrey’s horse, scraped the leg of General Meade’s boot, passed between General Ricketts and Griffin who were standing within a foot of each other, and buried itself in the ground, covering several officers with sand and dirt. Four Generals just escaping by a turn of the head, so to speak! I got this shell and shall send it home as a great curiosity. Abou Ben Butler had quite a stampede last night. Having got so far away from home, he conceived that the whole southern host was massed to crush him, and communicated the same with much eloquence, by the instrumentality of the magnetic telegraph; whereat Major-General Humphreys, Chief-of-Staff, had the brutality to laugh! We made our usual peregrination to Globe Tavern, where we got about 10 o’clock. Here General Meade sent me to look for a new camp, first enquiring if I felt well enough for that arduous service, as he looks on me as a tender convalescent! It was a tedious business getting a spot; for the whole country was either occupied, or was very dirty from old camps. At quarter to eleven, as I was poking about, I heard firing to the left, pretty sharp for a few minutes, and supposed there might be quite a fight; but it died away, shortly, except the cannon, which were not frequent. I got to the front about one, and met General Meade at the Peeble house. He had been to the Pegram house and it was near there he had such a narrow escape from a shell. I told them that, had I been there, I should have been the odd man that would have been hit; for they all said that the Staff could not well have been arranged again so that there would have been room for a three-inch shot to pass without hitting somebody. The cause of the firing was, that the whole line advanced, except the right division, and established a front position at the Pegram house. . . . The engineers were trotting round briskly, you may depend, ordering a redoubt here and a battery there, all intent on fencing in our new property. Luckily, the soil is very light and easy to dig, for our earthworks have now to be measured by miles. Not only must the front be protected, but the exposed flank and the rear. With what men we have, we do a great deal. Since we left Culpeper, I have not seen the troops look so healthy. If we could work a little more backbone into that 9th Corps, it would help wonderfully; but they started green and that is no way to ripen men. Many faults there have been also in the command. The men are in good spirits, I think, and well conditioned for the prosecution of the campaign. The evening of Sunday we went to our new camp, having lived nearly three months in the old one. It seemed quite like leaving home; for you get used to your little canvas house, pitched in a particular spot. The new camp is well enough placed, but in a region of evil savors. There is a timber bridge near by, and, every waggon that went over it, the General would jump and say, “By Jove, there is heavy musketry!” Gradually he learned the difference of sound and settled down quietly. The weather has been very warm the last day or two. Theodore Lyman’s letter is from Meade’s Headquarters, 1863-1865: Letters of Colonel Theodore Lyman from the Wilderness to Appomattox, pp. 231-2 and 237-8. Edited by George R. Agassiz. Boston, Massachusetts Historical Society, 1922. Available via Google Books.